Too much Chinese food with all the celebrations? 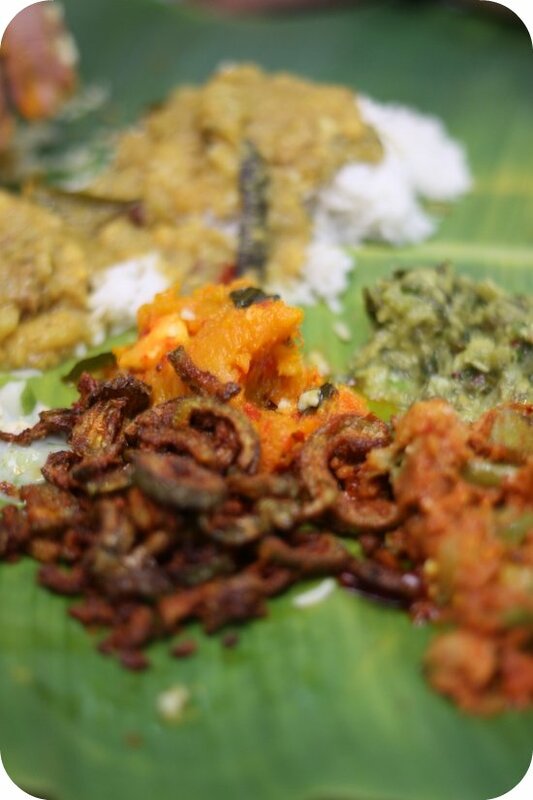 How about a little spice, rice and a real banana leaf to entice you to carbo heaven? 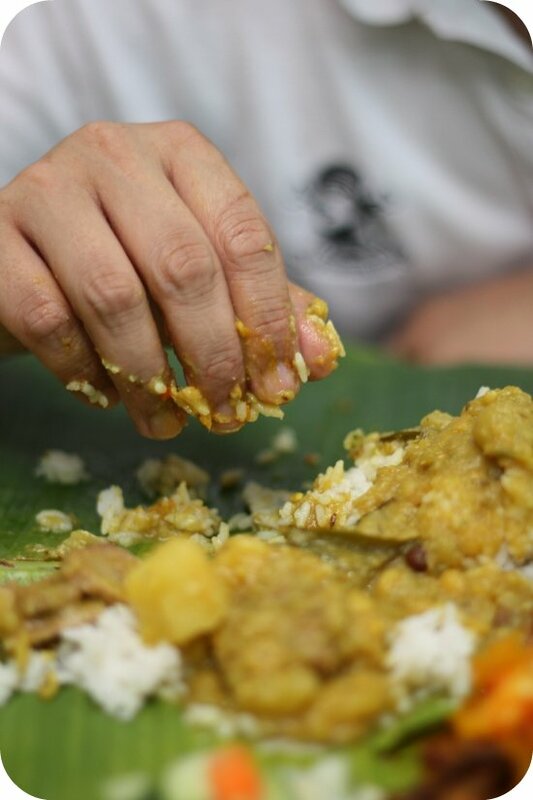 I was rather surprised the other day when someone told me they had the best ever banana leaf rice at Devi's Corner. Hence one lazy weekend, I decided to take the risk...and descended into food coma brought on by the excessive rice, meat and vegetables consumed in one go. Located on the upstairs section, obviously everyone else in town was in the know versus moi since the place was packed to the brim. We slot ourselves in between families waiting to be served. Service is a tad slow but we get going with our "real" banana leaf (no fake paper stuff as served in Kanna Curry House). Plop comes the piping hot white rice...shaped in a carbo mountain with a snowy peak. Next the vegetables and condiments.. it all goes down and the other half whispers to me..."they serve five items here instead of the usual three." I nod in slow agreement as I notice this place definitely does not stint on portions as my cucumbers in yoghurt, deep-fried bittergourd, curry vegetables and etc could have kept my tummy happy for the whole weekend. 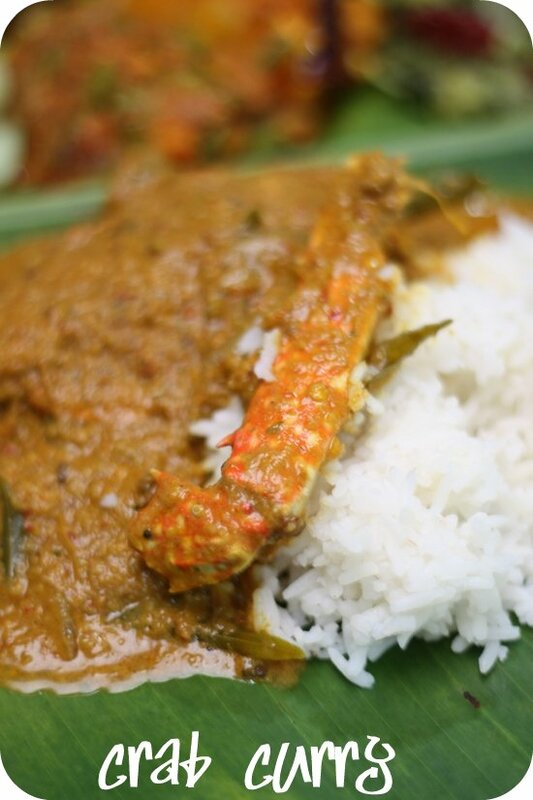 Then came the curries - dhals, chicken, fish and who can resist, the crab one that I relished each rich coconut milk laden spoonful of it with my rice. They also had mutton curry, which must be highly sought after as the Indian family of five boys next to me were all ordering this. Hmmm...next time I must order the mutton I made a mental note to myself. We add fried chicken called Chicken 65 or was it 69? God knows what it's real number but who cares since it's tender and delicious with a reddish coating. 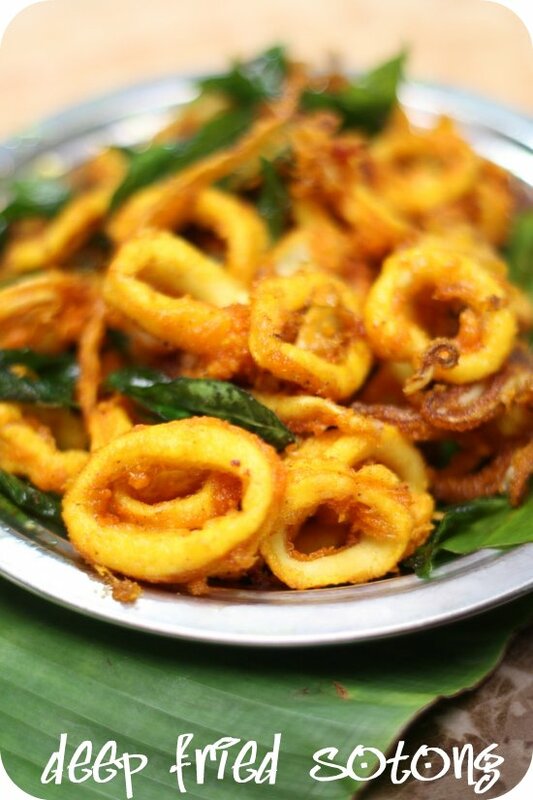 Equally good was the deep fried sotong glistening with a yellow tinge from the heavy hand of turmeric and their scattering of curry leaves. The jaws get cracking on the crunchy pappadums and they even gave us dessert - multi coloured bhindi, fried dough bits that look like tiny teardrops. One can't help but rub the tummy in satisfaction as the spices gently burn inside. Ahhh...such satisfaction as you amble down the stairs and into an afternoon nap at home. This is truly the best way to enjoy a lazy Malaysian weekend. How has the Water Dragon been treating you so far? I kinda feel like Stella who lost her groove as my zeal to blog is a little waning...but like all good people, I better get back in the saddle quickly or else, I reckon I will be fined again for blog abandonment issues. I'm clearing the mountain of backlog...including posts I had from last year during a whirlwind trip to Singapore. 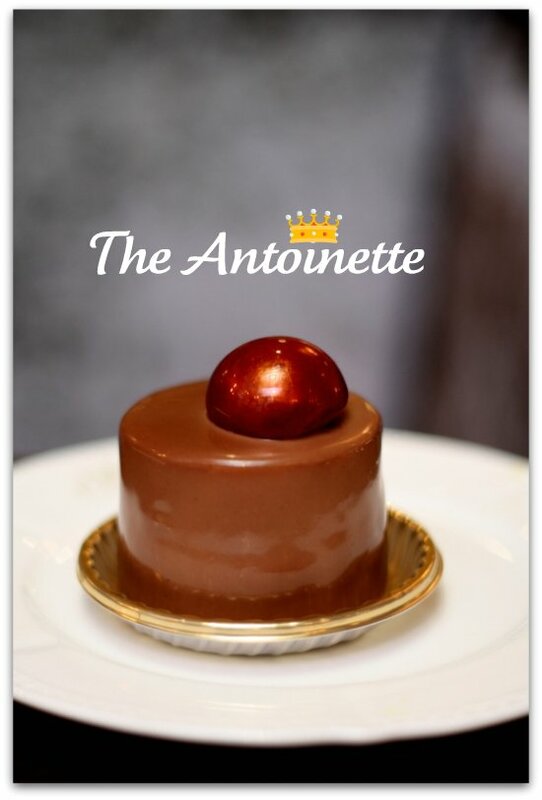 Since half of the family is there, usually time is devoted to them but I do manage to sneak some time out to check out this place Antoinette. The French may turn up their noses to this Laduree doppelganger-like cafe but it seems this place is so hot that you need to queue for at least 30 minutes or more to score a table here (they don't take reservations here unlike their other outlet). 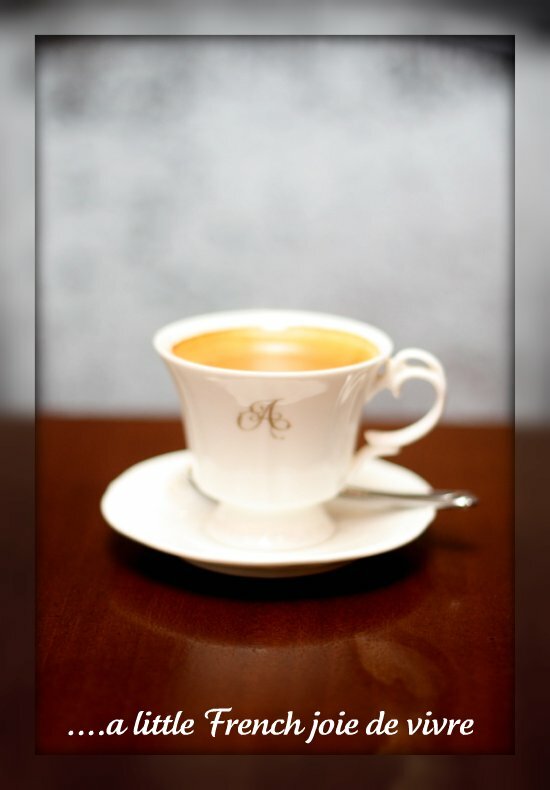 Designed like a French boudoir with a matte gold ceiling, chandeliers and black and white sketches, it makes a pleasant place to partake a cuppa provided you have ounces of patience for the long wait. One thing you will notice is the clientele is predominantly female with a scattering of faithful boyfriends or hubbies in tow. And...maybe because I was there just before Xmas, they were all dressed to kill for tea for major camwhoring sessions. Singaporeans, please enlighten me..is that the norm and they follow Tokyo where the girls like to dress up for tea sessions? 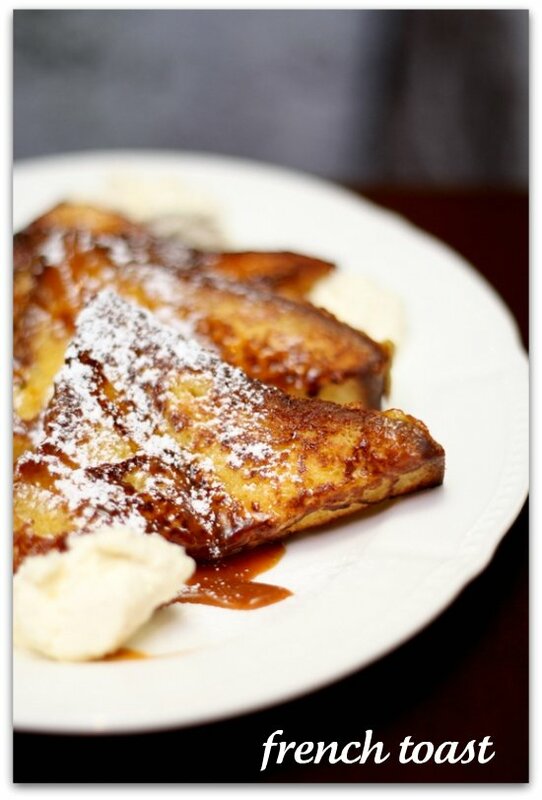 Since the tummy was rather full from lunch, I settled for French Toast with salty caramel. Made from rich buttery brioche, this came with a vanilla seed studded whipped cream. I rather enjoyed this - mopping the decadent caramel with just the right hint of saltiness with my fluffy butter laden bread. All around me, most people were ordering the breakfast items - all day breakfast choices with eggs, 24 hour baguettes, blinis (not shaped like small ones it seems but pancake sized) and eggs including an Egg Florentine. Another popular choice seemed to be pasta with egg, club sandwiches. The Queen of France may turn in her grave though as there's burgers in the menu. Maybe she can be appeased with sweet and savoury crepes or better still...her favourite cake. 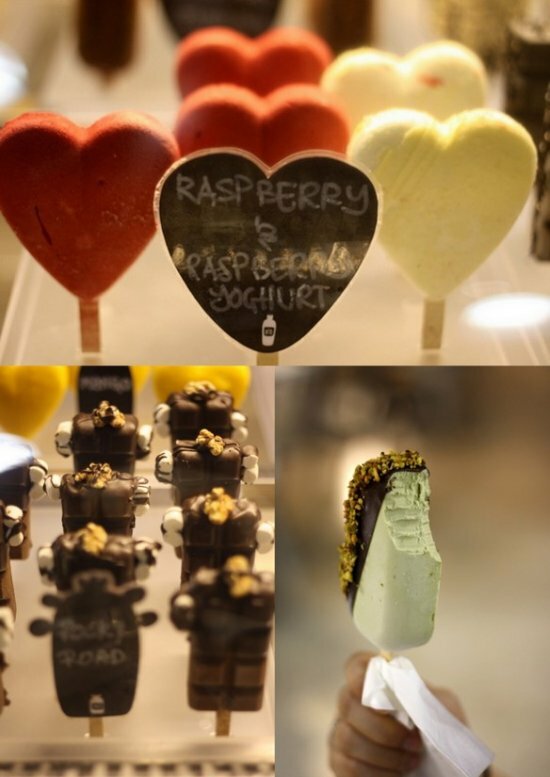 In front of the restaurant stands an enticing array of sweet treats - Religieuse of caramel with fleur de sel (Looking prim with her nun's wimpole), Saint Honore L'Amour topped with a red rose petal, mont blancs (chestnuts mountains), Le Royale with its dark chocolate cloak, and etc. 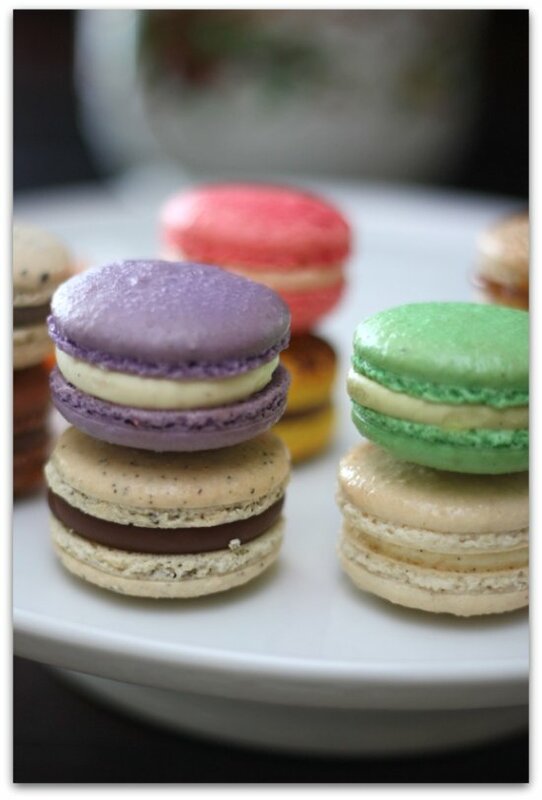 There are also an array of jewel-like macarons. 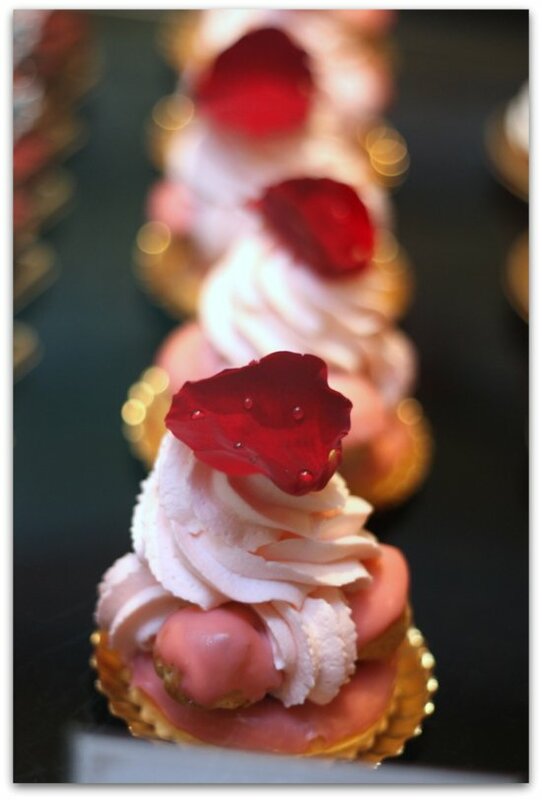 On the side table, are the meringues, kouglof, caneles and etc to tempt you. 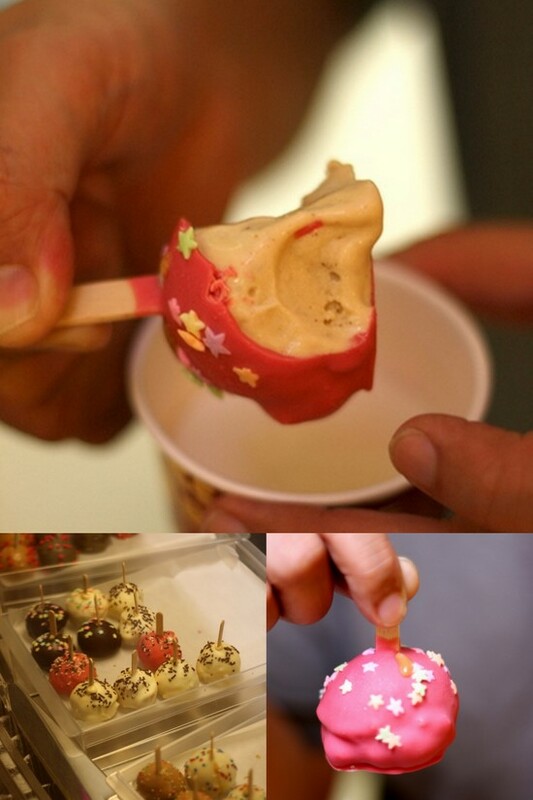 So much to choose from, I can image those who love sweets will go crazy here. I settle for the namesake, Antoinette. 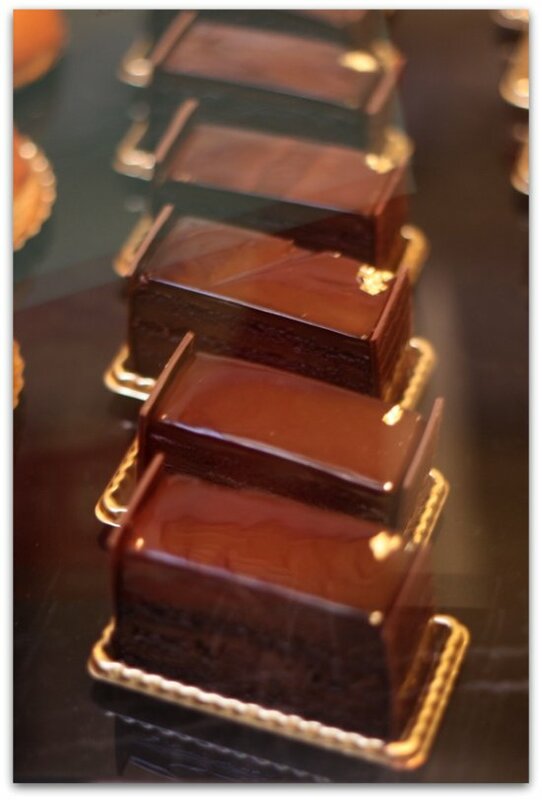 It is essentially a milk chocolate mousse infused with Earl Grey tea with a chocolate sponge cake and a bit of crunch within. 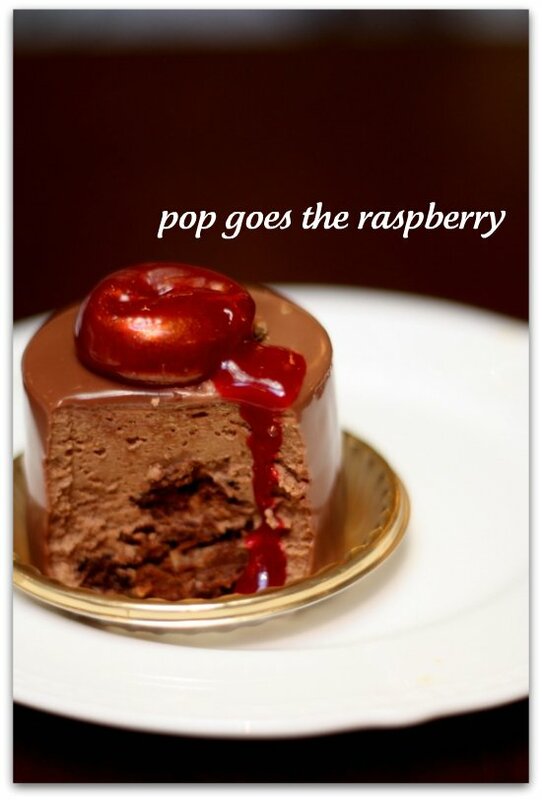 On its own, it can be rather rich but pop the berry on top and a dribble of raspberry sauce seems to balance out the decadent chocolate goodness with a hit of tanginess. In addition, I did pack some macarons home that I almost forgot. The baby blue boxes even resemble Laduree with their gold twirls on the side...just that it is not in pastel green. 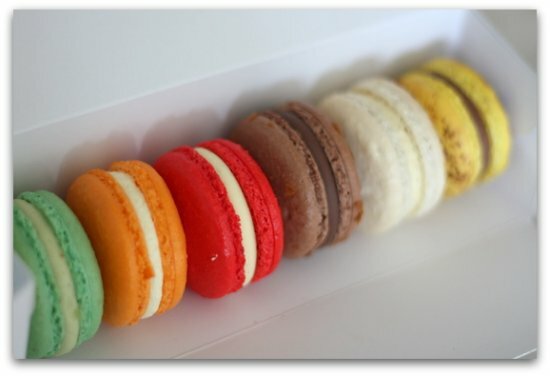 In general, the macarons were generously filled with ganache but flavours were a little on the artificial side I felt. Moreover, if you spot the pictures, the shells seem to have a grainy texture. To sum it up, I guess this is your next best thing without flying to gay Paree for the real thing. Service is efficient and brisk. 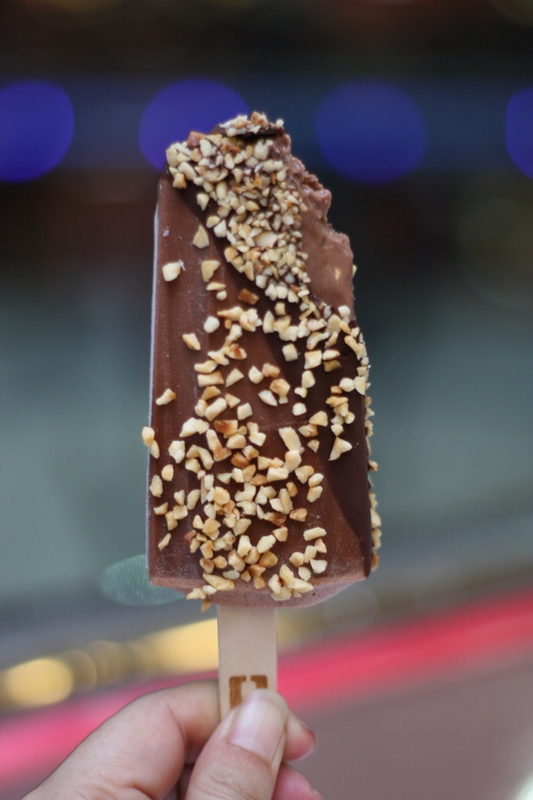 This happens to be part of Pang Kok Keong's sweet empire. Formerly from Les Amis and the man behind the Canele, this Parisian themed patisserie joins his Pique Nique, a laid back diner. 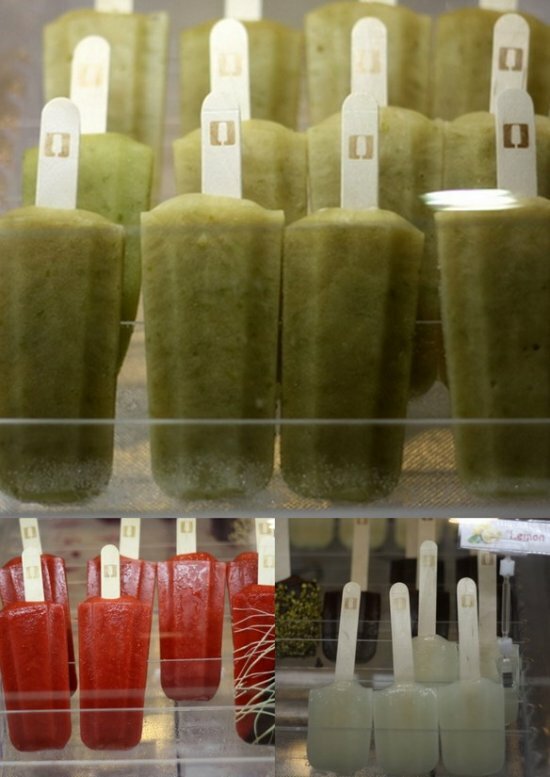 When it comes to innovative and great tasting food, Gu Yu Tien trumps everyone in the market. 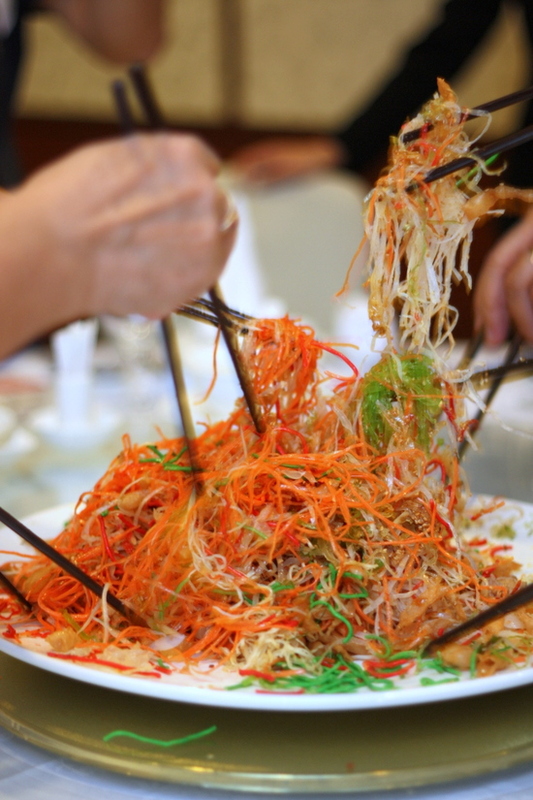 This year, their Chinese New Year offerings is a balance of old favourites (as many of their clientele can't do without) and something to summon the dragon, their Dragon Fish Yee Sang (RM98++ for 10 persons). 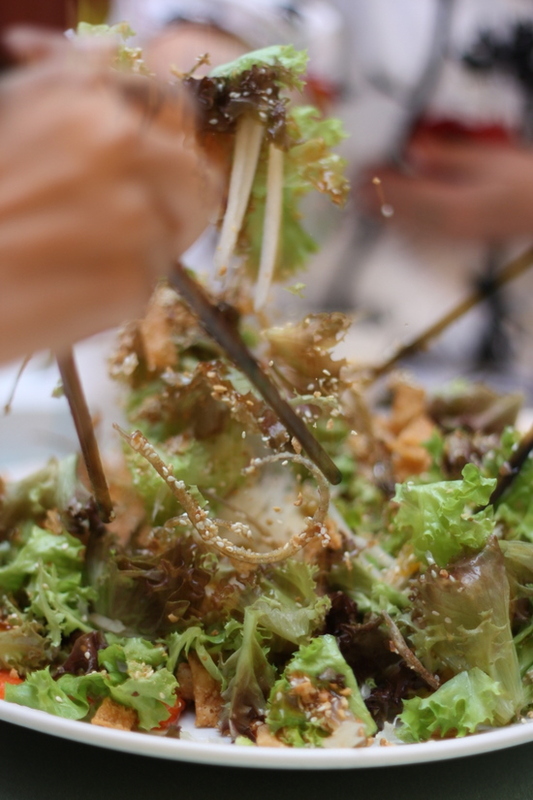 While Gu Yu Tien still maintain their healthy outlook for their yearly offering of the prosperity yee sang (green coral lettuce, golden raisins, pears, pomelo sacs, salmon sashimi, sesame seeds, strawberry sauce and crunchy "pok chui" crackers), this year sees the addition of these dragon like fishes. These sharp toothed sea fishes add a nice crunchy taste to the whole festivities. 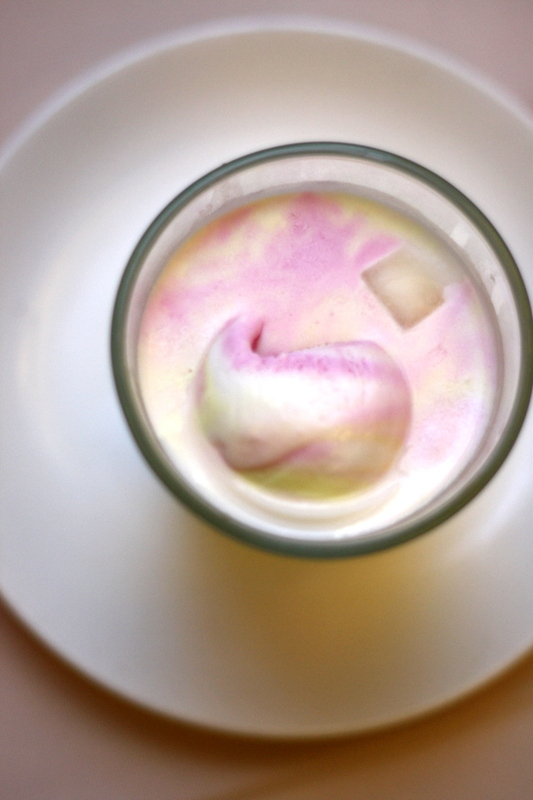 Toss them around and they look like dragons flying in the sky, an auspicious way to usher in the new lunar year. 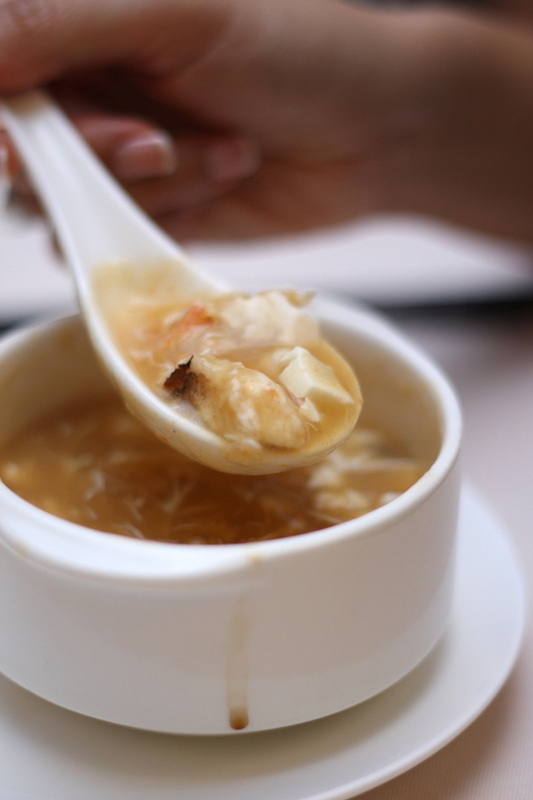 Nowadays with the outcry of cruelty to sharks, restaurants are saying no to the Chinese delicacy. Gu Yue Tien tries to balance between the old and the new, offering the two varieties, one with and without. However, a taste of this sumptuous thick seafood broth filled with crab roe, crab meat, prawn, scallop, squid and tofu cubes will make anyone happy (including those old folks) that they won't nag when they don't see those forbidden fins. 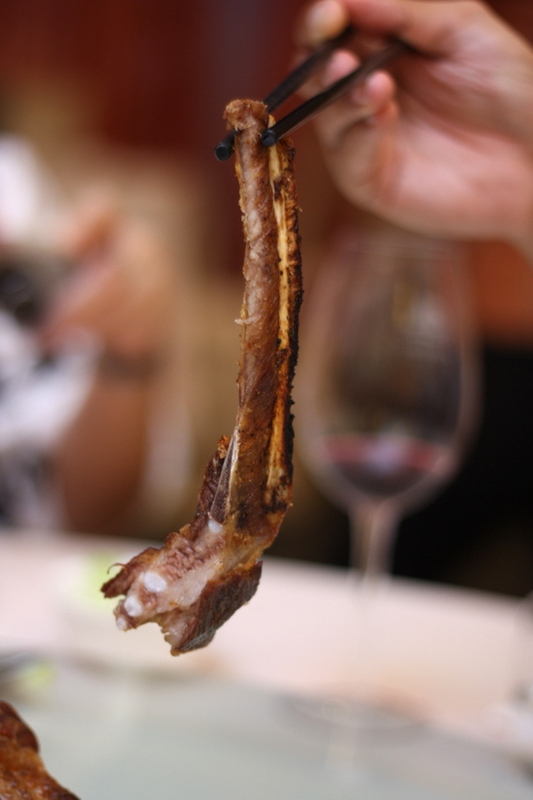 A must-have when you dine here is the superb salt baked Spanish Iberico spare ribs. 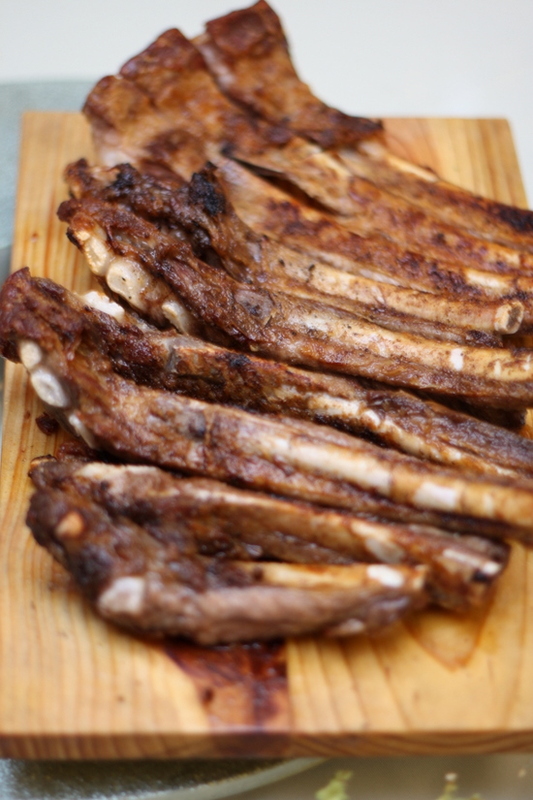 It is so finger licking good that you won't mind getting your hands dirty to eat every small morsel of the delicious meat. I do love my Hunan food hence I was a little surprised to see Chef Frankie unveil these spicy dishes. I've always pegged him as a Cantonese guy but he showed today his breadth of skills (seems he is also well versed with Shanghainese and Szechuan dishes). 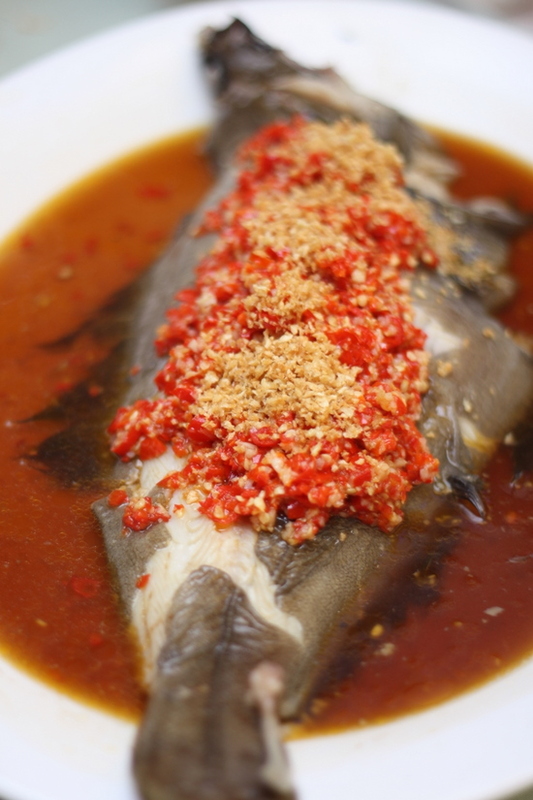 Rather than any old steamed fish, he marries the Western favourite aka the halibut fish with a spicy chillies and garlic topping. 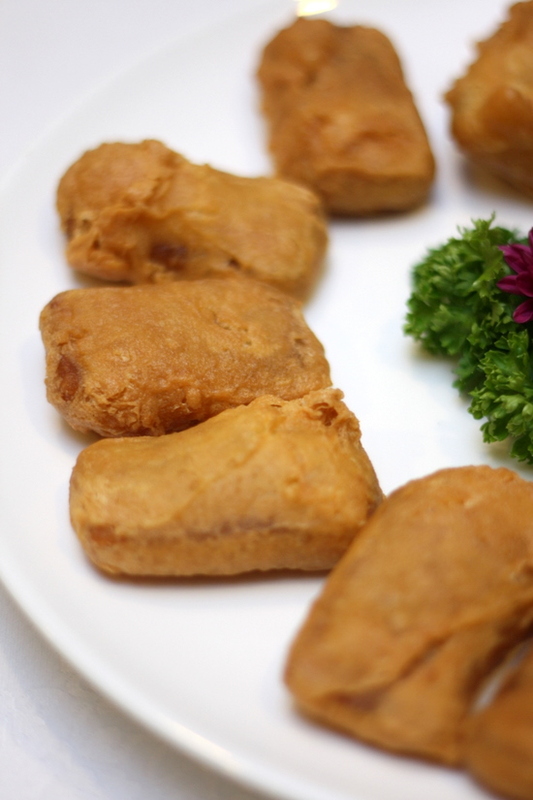 The fish flesh is perfectly steamed until it becomes a creamy texture with its omega rich oil content. The not overly spicy but well balanced chopped red chillies and garlic complement the whole dish so well that you end up lapping every delicious bit. I've always loved the steamed fish here and for those who prefer more delicate flavours, you can opt instead for their steamed australia jade perch fish with light soy sauce. Another omega oil rich fish, the flesh is silky smooth especially when dipped in their aromatic but not overpowering sauce. While Chef Frankie is open to all types of Chinese food, he prefers to keep his Szechuan dishes to a lower spice level for it to reveal its many layers of flavours. 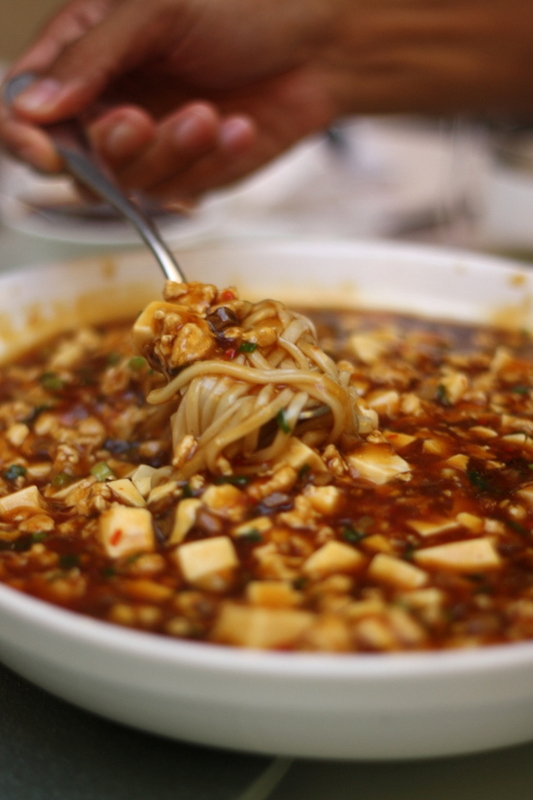 For instance, he ingeniously pairs the classic Szechuan Ma Po Tofu (named after this pockmarked lady, claims the legend) with these silky smooth noodles. The flavours in this dish is incredibly controlled for you pick up its subtle nuances - the bean paste used in the sauce, each niblet of the minced meat, the silky tofu cubes and the chopped chillies. 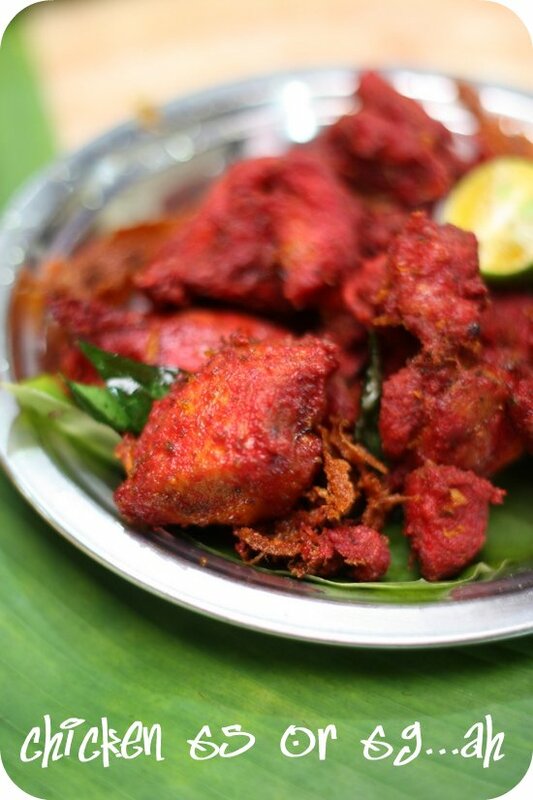 The slight spicy taste is rather appetizing too that seems to warrant seconds even though you are full to the brim. 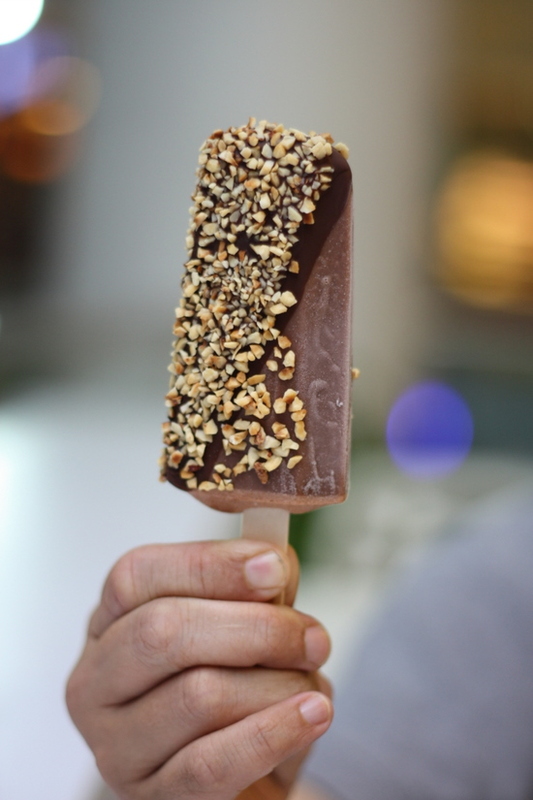 From the fieriness, we cool down with the aromatic Chinese almonds cream. Boasting a strong flavour of the Chinese almonds (which are in truth apricot kernels), this was lusciously smooth. 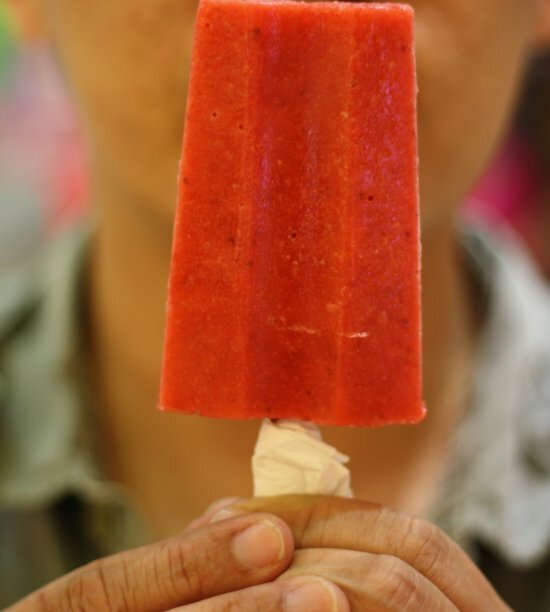 Chopped fruits add a textural contrast while the scoop of vanilla ice cream gives it a creamy cool edge. 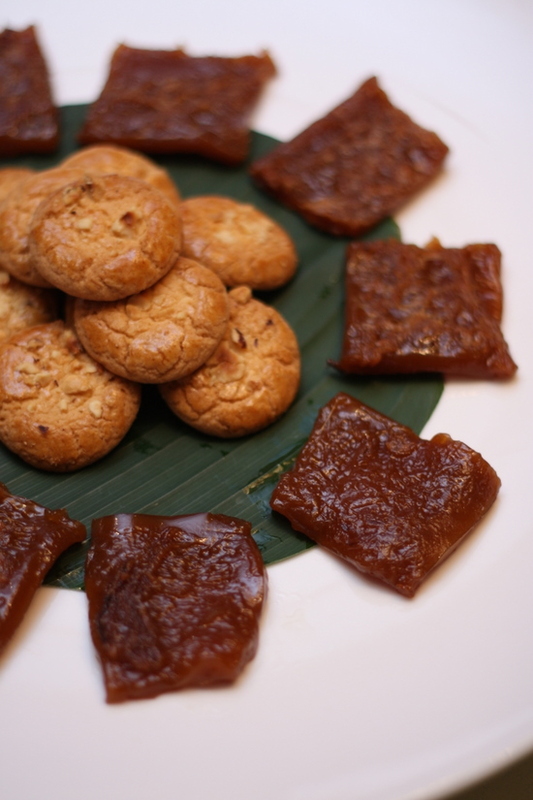 Specially for the festive season and a must to keep those reporting Kitchen Gods abay from spreading nasty rumours about you, is the traditional nian gao. 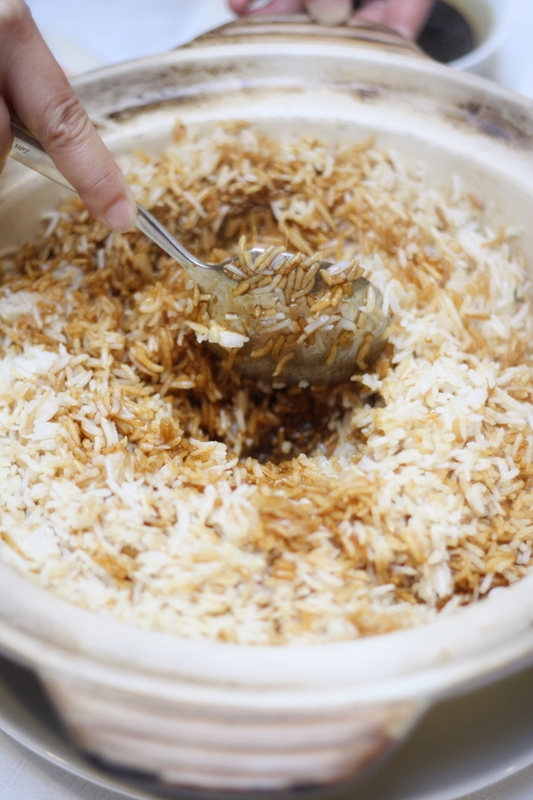 Usually pan fried, Gu Yue Tien also does the steamed version that gives it a soft melt in the mouth texture that is seasoned with salt and rolled in fresh coconut shreds. A much healthier and unusual version compared to the pan fried one. While most of the Chinese New Year sets they have feature the pan fried nian gao, you can request for this healthier version if you like. 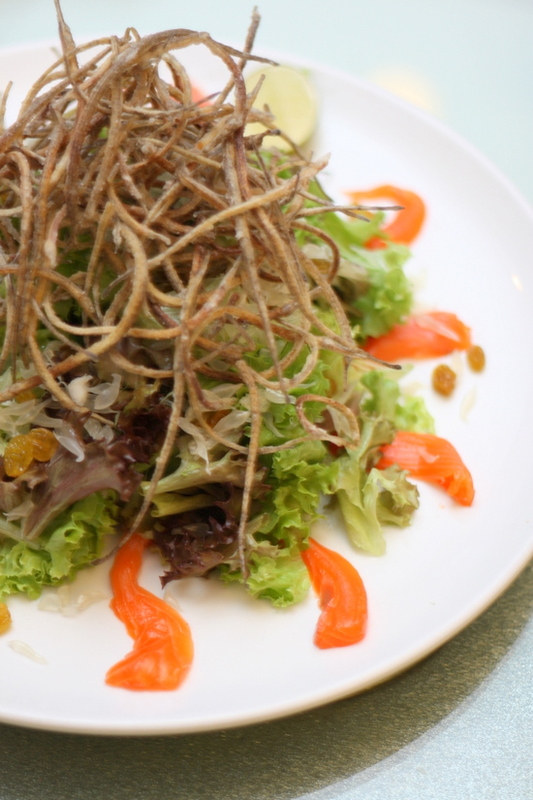 For the festive season, the restaurant has various menus to cater to your needs. Prices start from RM738++ to RM3,999++ for ten persons. 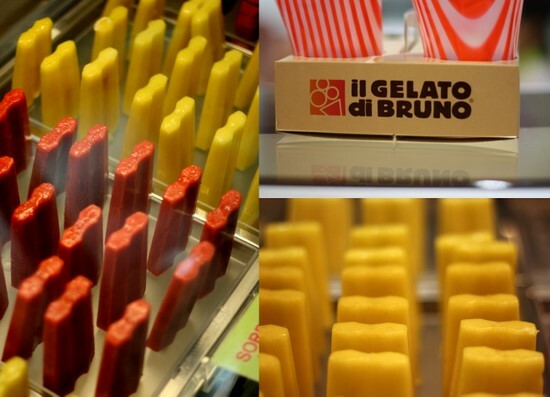 They also cater to small parties (minimum two persons) so check out their offerings. (I will place the scanned menus in my Flickr set later in the day). *This is an invited review by the owner. 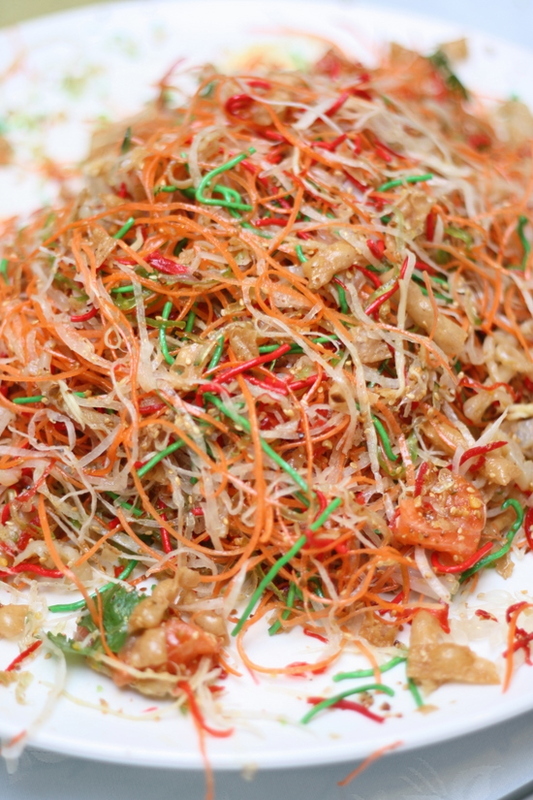 Tis the season for yee sang, the colourful salad that rings in our prosperity wishes. Recently, we rolled off the celebrations with dinner at Chef Choi. It was actually more of a dinner to celebrate a friend's return from Europe and the USA with lots of goodies for us to savour. 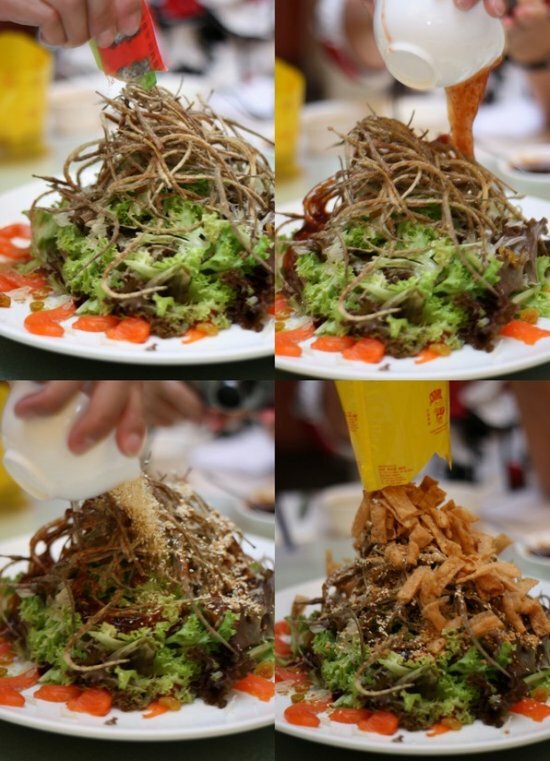 Since the festive season was just round the corner, we also indulged in the festive goodies such as the yee sang. The version was very much the traditional one with the crunchy yam shreds, ocean trout sashimi and a drench of their yummy plum sauce. 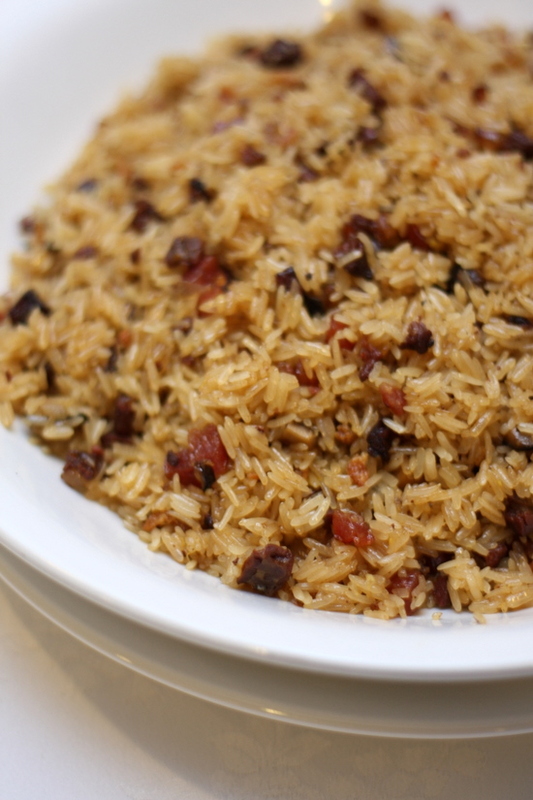 Another festive must have is the lap mei fan and Chef Choi's version is a teensy weensy healthier with the use of low GI basmati rice instead of the normal white rice. While it means you sacrifice the crust, this version mean you can finish your rice happily after a full meal. 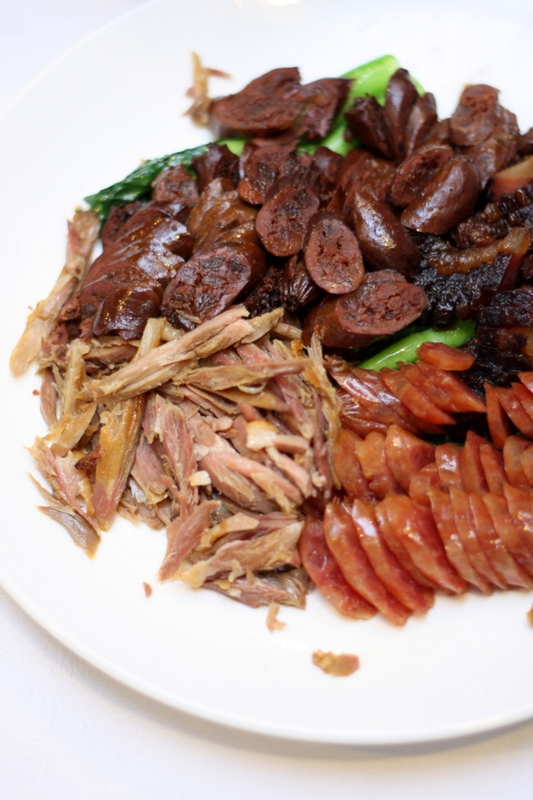 The waxed meats are superb including the famous goose liver sausages from Hong Kong's Yung Kee. Surprisingly locally made lap cheong is used and it is just as good as the Hong Kong versions. 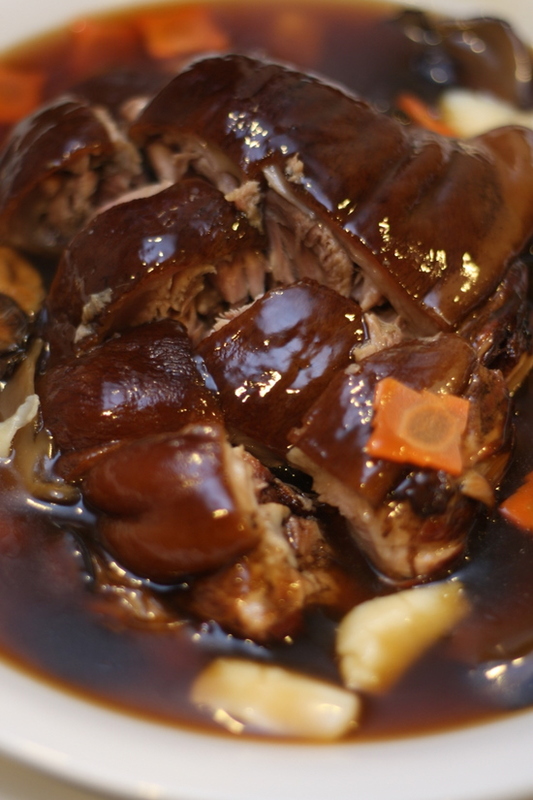 There was also a lot more indulging that night including this melt in the mouth braised pork shoulder served together with all those yummy Chinese New Year goodies such as mushrooms, fatt choy, dried oysters and fresh scallops. We ate our greens in the form of braised wah wah choy with dried scallops dutifully as we knew more rich crazy carbs was coming our way. 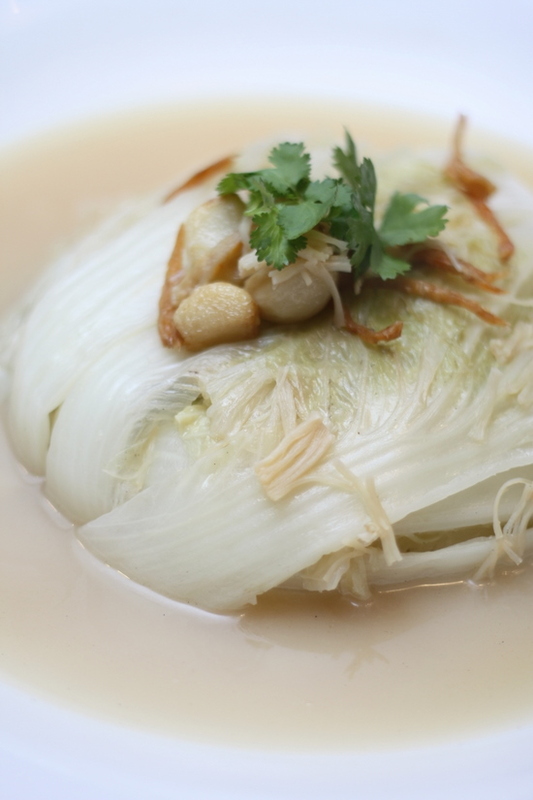 This braised dish is always a big favourite of mine that I often have second helpings of the smooth cabbage with the broth and dried scallops. 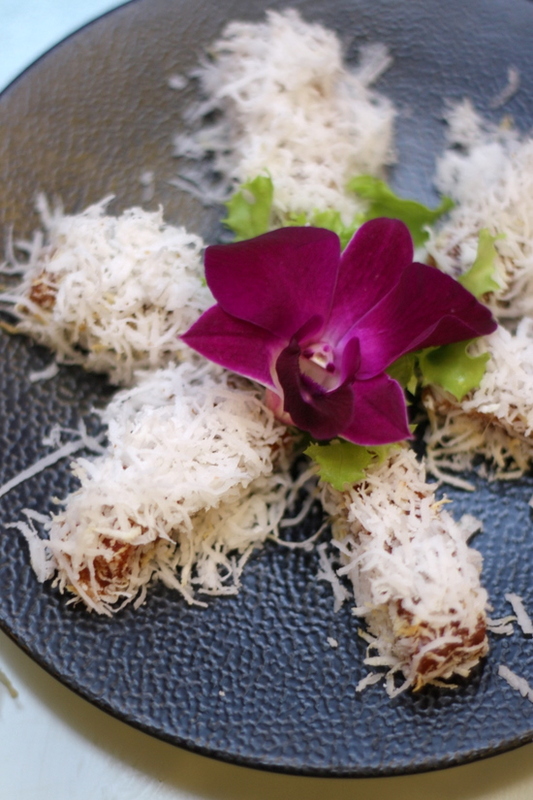 This was simply gorgeous - the special fried glutinous rice with Hong Kong goose liver sausage. 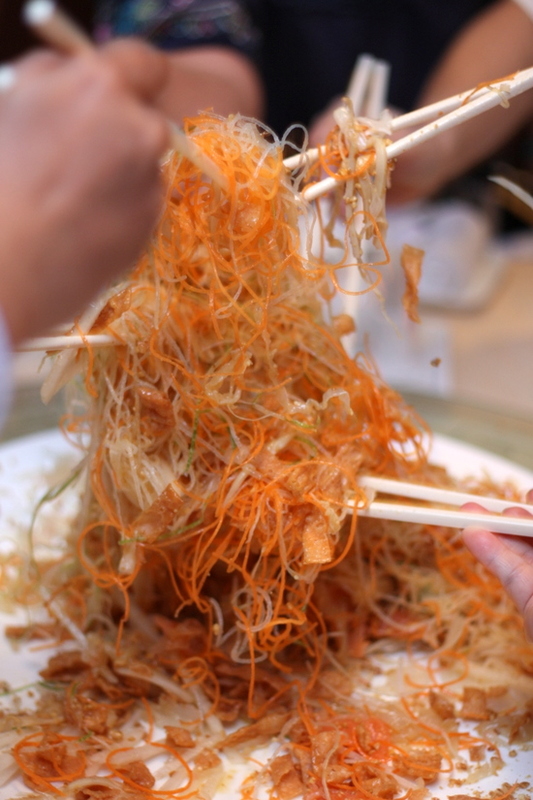 If I wasn't so full from my lap mei fan, I would have eaten loads of this. The sausage adds a nice rich taste to the rice as each nibble bursts into a umami fat laden explosion in the mouth. Since we could not finish this, takeaways were packed and people were eyeing this for their supper or breakfast the next day. Finally desserts to end the magnificent meal - the traditional crispy Chinese New Year cake with yam encased in a crispy batter and the very not traditional tiramisu. 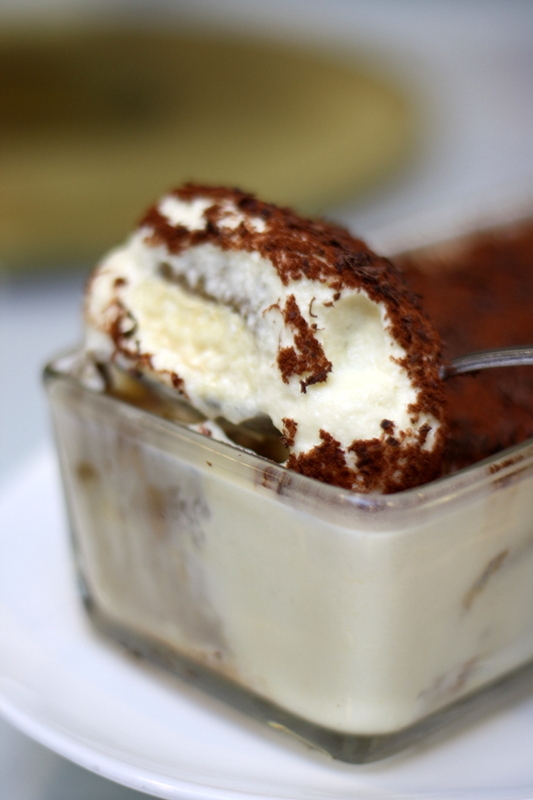 The tiramisu is simply gorgeous and very light tasting since beaten egg whites are folded to lighten the mascarpone cheese. 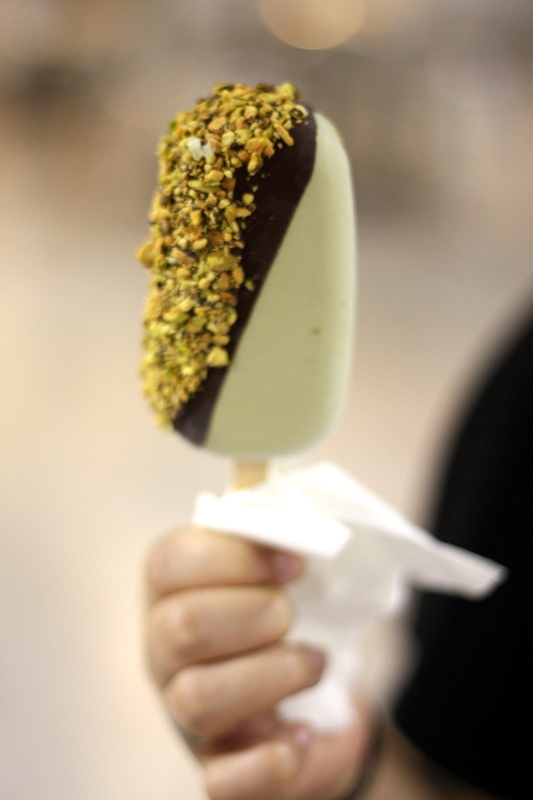 So much indulging with great food....thus the best thing of these festivals. *The meal was part of a private dinner between friends where the host paid for the meal. Toss your way to prosperity.....the Year of Dragon is just round the corner. It feels like just yesterday that New Year zipped past us and now another big celebration is due on the horizon. I must admit I'm not ready for the celebrations. Nevertheless, there's no way to stop time from ticking away so the best thing is to make it a great celebration. Elegant Inn is often our de facto choice for family dinners hence it was cool to get a preview of their Chinese New Year offerings. 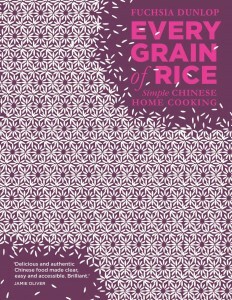 Makes planning for that all important reunion meal so much easier. 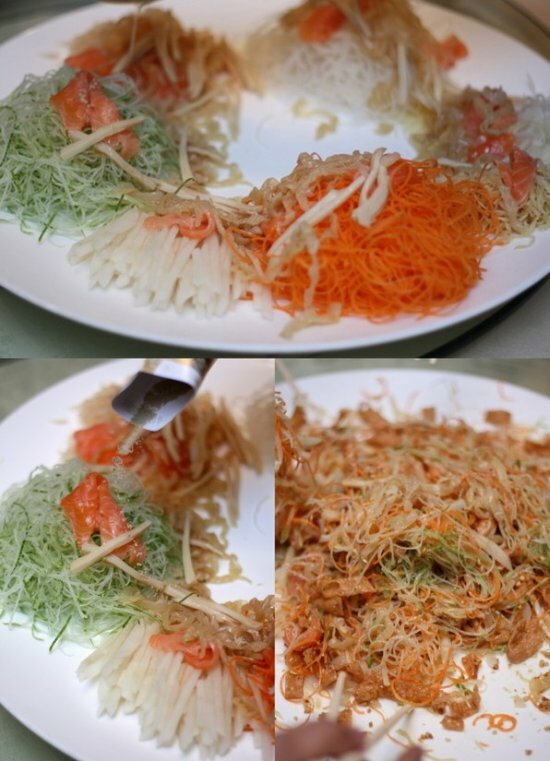 At the Hong Kong centric restaurant, even their yee sang is different - a combination of three items to make it even more bountiful - salmon, clams and crunchy jellyfish. 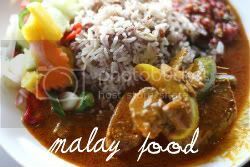 Keeping health in mind and taste, their prosperity dish does not contain a single strand of pickled vegetable or deep fried shredded yam. Instead it is all vegetables - a medley of turnip, pear, radish, carrots, maybe just one pickled leek, pomelo, cucumber and ginger. 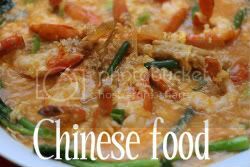 There is also the must-haves aka the pok pok chui or crackers with a sprinkle of pepper, salt, oil, plum sauce and a generous sprinkle of coarsely ground peanuts. The wait staff in Elegant Inn add a touch of specialty to the yearly affair by adding auspicious sayings. All the better I reckon to toss and lo sang away to good health, prosperity and whatever our heart wishes. 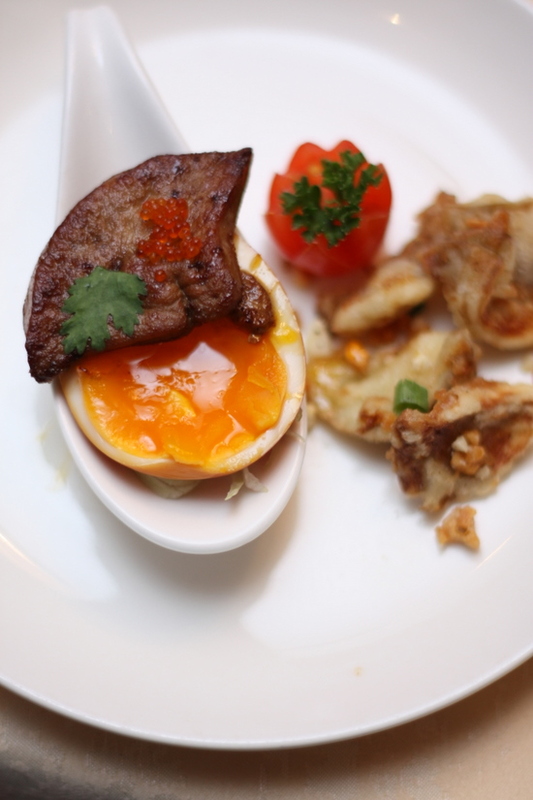 Once the salad is finished down to its last crunchy cracker, we enjoy a "simple" starter - crunchy salt and pepper coated oyster mushrooms paired with decadent smoked egg topped with a piece of pan fried foie gras. 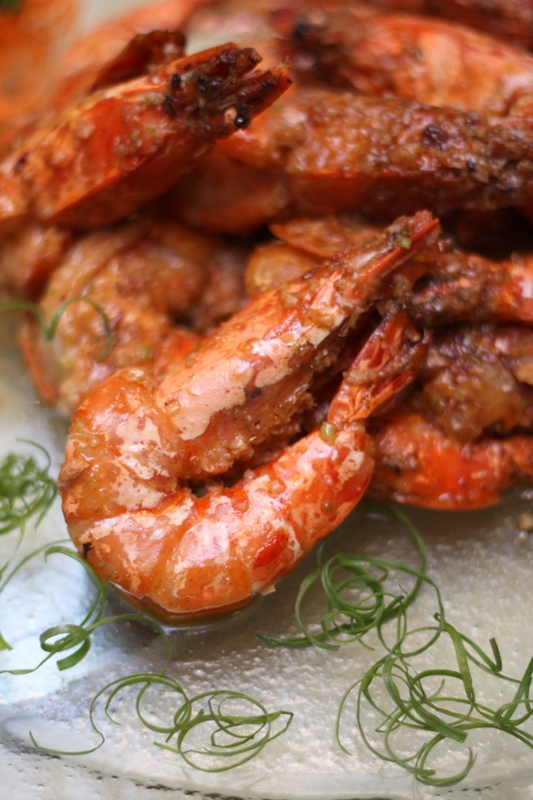 Prawns are a must for the occasion since they signify happiness. You will be happy to get these sea based crustaceans lovingly coated in a light wine sauce. Believe me, the sauce is finger licking good that I ended up even chewing on the shells for every drop of its delicious sauce. Next comes an interesting dish, a play of textures in the mouth and of course, the flavours. Nicknamed the crunchy Chinese sandwich, this was a layered beauty. First layer enclosing it was a pillow soft bun, followed by a crispy chicken skin lightly touched with prawn paste that sandwiches a crunchy soybean skin nacho. 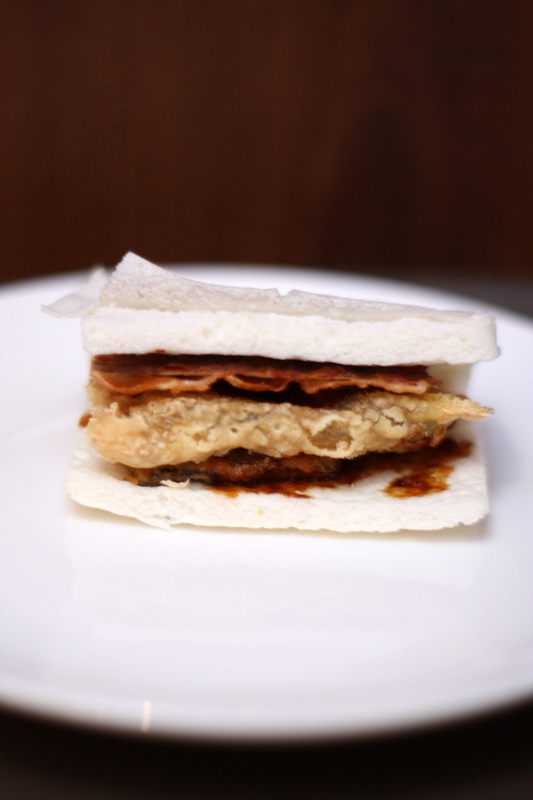 Lastly a piece of Chinese ham completes this delectable sandwich that you has you clamoring for more. 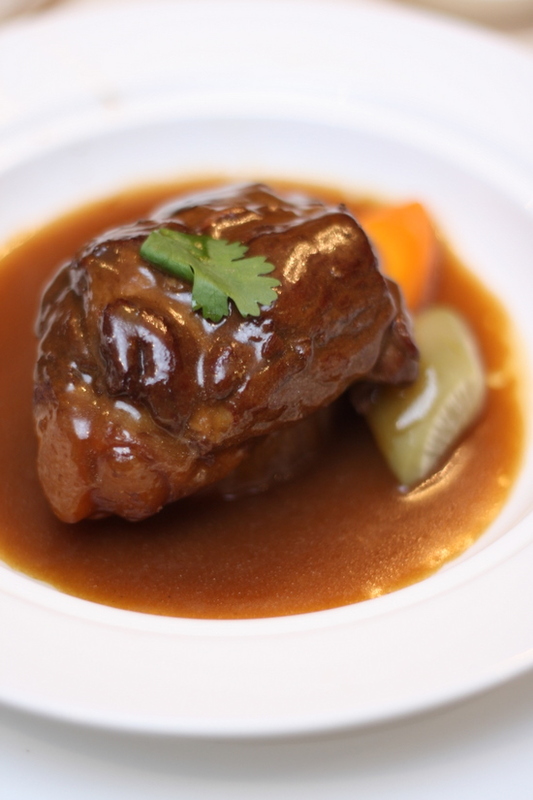 The piece de resistance was the old fashioned braised pork cartilage rib slow cooked for four hours to fork tender meat and soft bone. The green radish and carrot balances out the rich taste of the dish that you wish you had a bowl of rice to soak up every drop of that delectable liquid. One must not forget Elegant Inn's infamous lap mei fan. 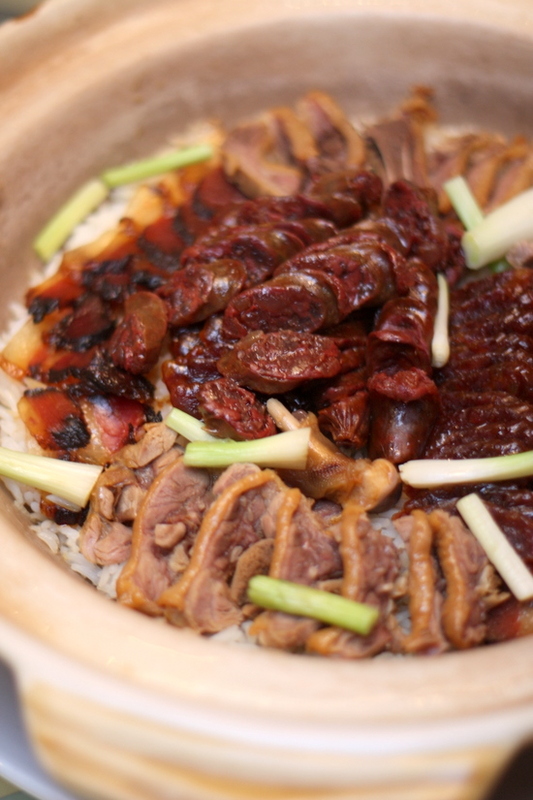 The waxed meats are all handpicked from Hong Kong with a rice that is cooked to fluffy perfection with just a teeny weeny crust at the bottom. 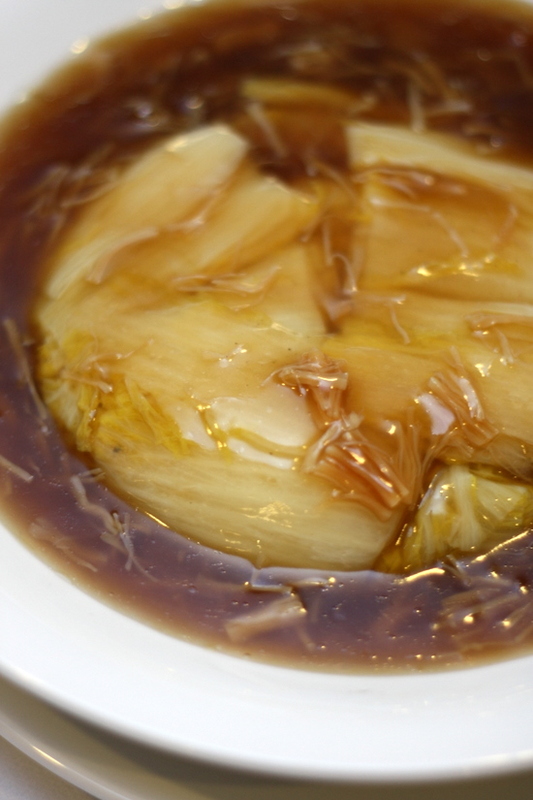 My personal favourite was the simmered Chinese cabbage with Japanese dried scallops and HK dried prawns. The vegetable is cooked till tender and infused with the lovely aroma from the dried seafood that I had to have seconds of this dish. 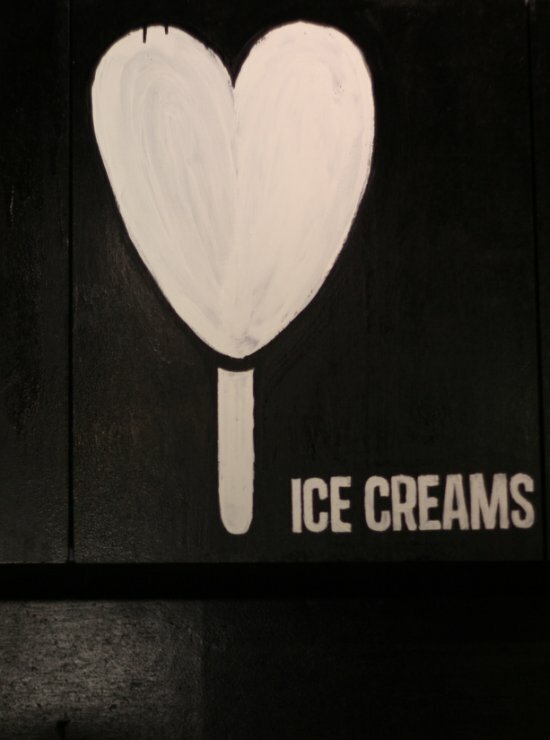 Like a person once told me before, dessert is reserved for a second stomach. Not sure if this is a true since I don't think we have the anatomy of a cow that boasts of multiple stomachs. 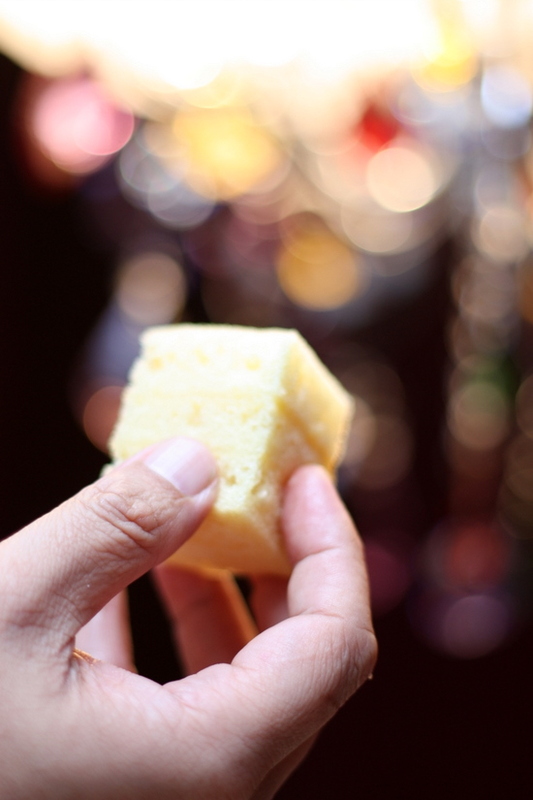 However, when it comes to sweets, we seem to always find a way to consume it including such seasonal items like the New Year cake or ning ko. 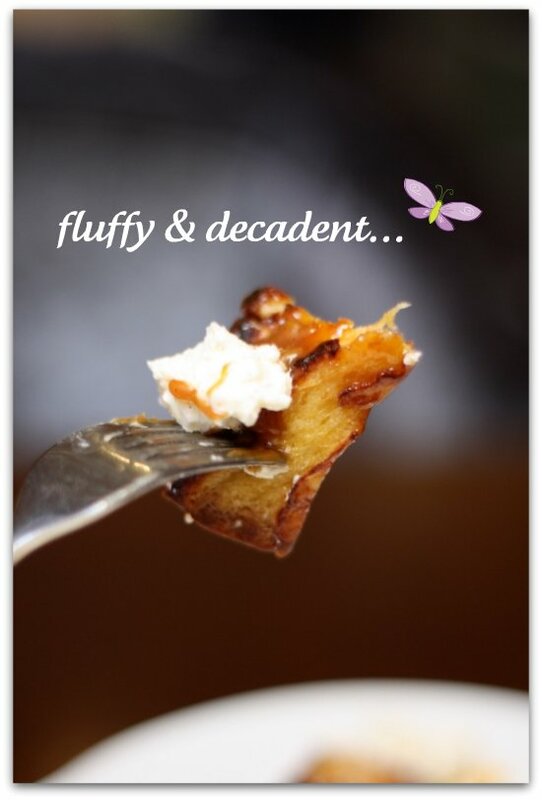 Elegant Inn's version is just pan fried till it becomes a soft delectable gooey cake with crispy sides. They also make their own hazelnut cookies that have a simple yet alluring taste. 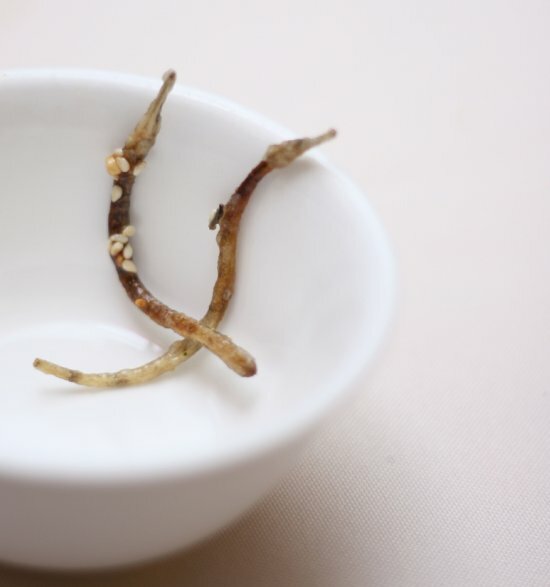 Pair this with a lovely red bean paste with black glutinous rice. 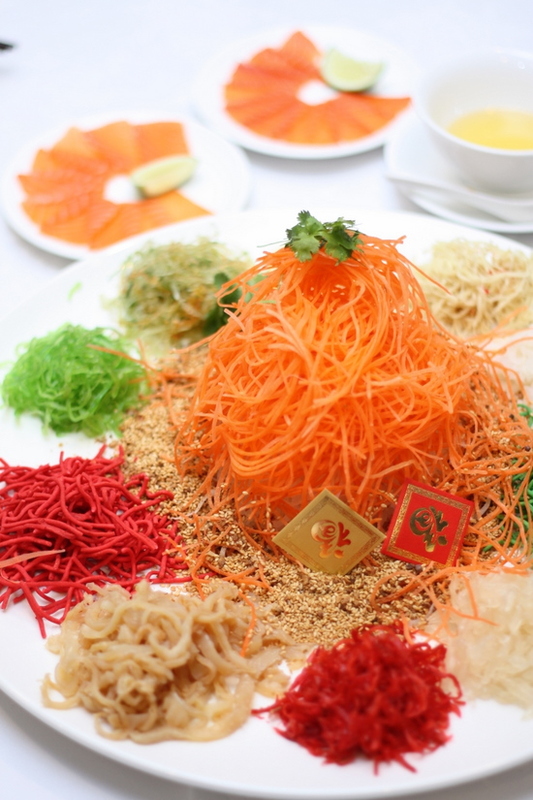 Last but not least, a meal is never complete at Elegant Inn without my favourite dessert, their fluffy Ma Lai Koh or steamed cake. 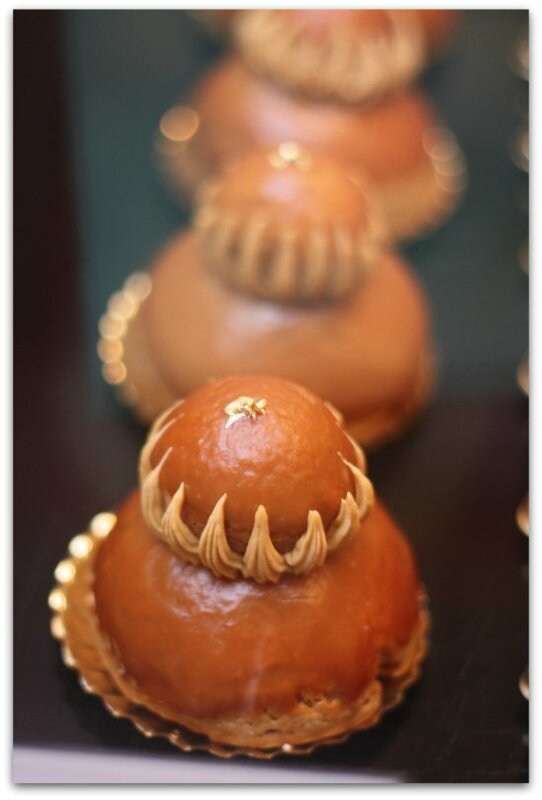 The pillow soft steamed cakes are gorgeous and always a must order for the family. I reckon this meal at Elegant Inn has sealed the deal on where we'll be eating reunion dinner soon. How about you? Where will dinner be? Homeward bound or out at the restaurant for the celebrations. *This meal was an invited one. For more pictures and the set menus, see the Flickr set.